Members of SPARR near Fern Drive and Miles Bank. The relief road is proposed to go over the railway line via a bridge that will rise close to the barn in the background. 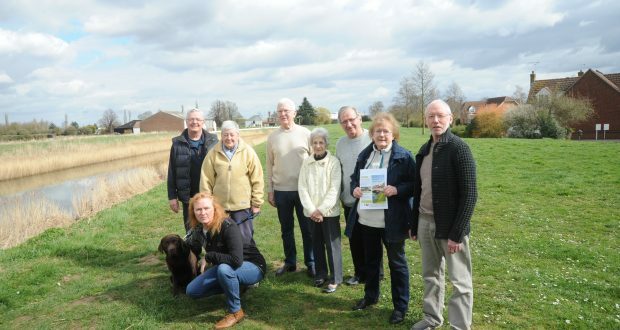 A campaign group has been launched calling for further consultation on the Spalding Western Relief Road, planning applications for the first two sections of which were submitted last week. The Spalding and Pinchbeck Against Relief Road (SPARR) group has been set up to unite residents from both towns opposing the proposed road and it’s set to hold a public meeting over the issue set to be held at The Vista in Spalding at 1pm on Saturday, March 30. Lincolnshire County Council hopes the proposed single carriageway relief road will alleviate congestion in the town, but several concerns have been raised over its route including residents on Bourne Road being left in the dark over the possibility of their homes being bulldozed as part of the route. SPARR has been initially set up by Fern Drive couple Stacy and Petra Barneveld-Taylor whose home would look towards a proposed nearly-30ft-high bridge over the railway that’s part of the submitted planning application most northerly section of the road from Spalding Road. Stacy told The Voice they’d been in touch with Bourne Road and Pinchbeck residents who had also agreed to join the group. She said: “We knew of the road when we bought our house three years ago, so we went to the council to look at the plan. The road was going to be much further away than with a large green space separating it from Vernatt’s Drain. “We showed up at the consultation last month and the road’s been moved closer. It will also slope up to go over a 39ft bridge so we’re going to be looking at a concrete wall. “We’ve contacted a couple of neighbours and they had no idea. “We’ve also seen the complaints from Bourne Road residents and Pinchbeck residents and we’ve decided to set up a united group to urge consideration of other options and for more consultation to be carried out. Stacy continued: “It’s called a relief road but it’s not going to provide any relief. The other planning application submitted is for the portion of the road from the B1172 Spalding Common to Holland Park Sustainable Urban Extension (SUE). It includes another similarly high bridge near Spalding Common. The planning application for the northerly section includes the diverting of the Blue Gowt Lane cycleway. Coun Richard Davies, the county council’s executive member for highways, said: “Not only are there several new residential developments planned for the area, but we’re also expecting an increase in the amount of freight passing through town. “Because of this, there’s a desperate need to start working towards making future travel in and around Spalding quicker and easier by building a western relief road.